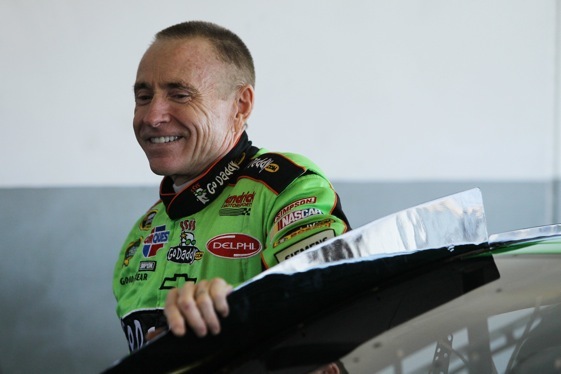 Joe Gibbs Racing announced today that Mark Martin will drive the Interstate Batteries Toyota Camry in the 2012 NASCAR Nationwide Series race in Las Vegas in March. While Martin is only currently scheduled to race in Las Vegas for JGR, the team is still working on opportunities for the veteran driver to secure additional races. Martin spent the last three seasons driving a Sprint Cup car for Hendrick Motorsports. HMS signed Kasey Kahne to drive the No. 5 car beginning in 2012. Martin currently has 49 career victories in 235 Nationwide Series starts, Martin has amassed 111 top-five and 151 top-ten finishes, while leading 8,093 laps. His most recent victory came just last season when he piloted the No. 32 car to victory lane in Las Vegas. He had four total starts in 2011, with the one victory and three top-ten finishes.